Moira Queen's trial begins and is expected to be the story of the week in Starling City. That's before a mysterious malady begins afflicting random people around the city, including John Diggle and Adam Donner. With Donner ill, Laurel must take over the city's case against Moira and finds herself privy to the terrible secret Moira wished to hide from her children. It turns out the mysterious "plague" is the after-effects of a new version of Vertigo. The Count is back in Starling City and he's found a new way to hook the entire city and create a demand for his new Vertigo formula, which he claims is the only thing to stop the withdrawal pains now afflicting Diggle and hundreds of other citizens. Both Starling City and his family need him but can Oliver Queen see to them both? The trial scene is a bit of a shambles all around. Ignoring the obvious conflict of interest in having a family friend of the defendant act as prosecutor, Jean Loring doesn't come off as a particularly competent lawyer. 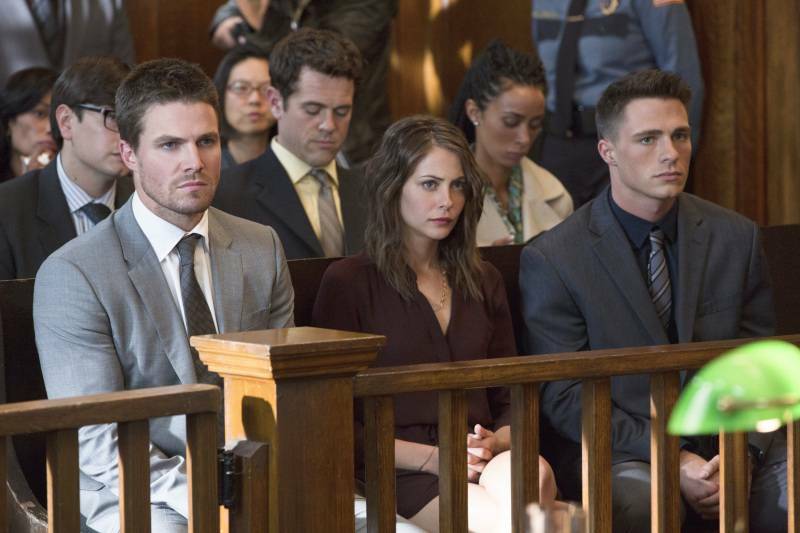 One wonders why Ollie wasn't called as a character witness as Thea was. It might make sense given that it's a matter of public record that Ollie left town for several months but you'd think if Loring was worried enough about that to not call Ollie as a character witness, she'd be equally worried about Thea's refusal to talk to her mom for that long. Finally, one wonders what evidence the D.A's office had that proved Malcolm Merlyn and Moira had an affair and - more importantly - how it could have destroyed her case that she was being blackmailed/threatened by Merlyn. Surely the idea of someone blackmailing someone with evidence of an affair is not unheard of in Starling City? Ollie says he developed an antidote for Vertigo. Maybe this is short for "I had someone in our Applied Sciences department at Queen Consolidated develop an antidote for Vertigo" because magical healing herbs aside, Ollie has never been portrayed as being that kind of chemical genius. Particularly given that he needed Felicity's help to analyze the drug back in 112. Felicity notes that a The Count used a STAR Labs satellite to bounce his broadcast signal and that he could have been broadcasting from Markovia. Markovia is a fictional European nation in the DC Comics universe, located in between France, Belgium and Luxembourg. It is the home of the earth-manipulating heroes Geo-Force and Terra. A reference to Vlatava - the small European nation ruled by Count Vertigo - would have been more appropriate. Kate Spencer is once again identified as one of the lawyers in the Starling City District Attorney's office. In the comics, Kate Spencer is a lawyer who later adopts the identity of The Manhunter to fight crime. Roy gives Mia a pair of red boxing gloves in order to allow her to relieve some stress. Red, naturally, is Roy's color in the comics and The Boxing Glove Arrow is one of his and Ollie's most infamous trick arrows in the comics. The numbers on the back of the Arrowhead - 30 31 75 12 - do translate to a real-world map coordinate when converted into Degrees and Minutes. The location is in Northern India, near the border with Pakistan. Apparently that Japanese ship went VERY far inland. With the right half of his face blackened from the burns, Slade's face now resembles Deathstroke's mask in the comics. Shado: They have Oliver. I'm going after them. Shado: You can barely walk! Slade: All the more reason not to stay here. I'm not giving them another chance of blowing me up. Ollie: No you don't. I made a choice not to put an arrow in this guy and it was the right choice. There's no more killing. Ollie: What do you want?! The Count: World peace and personal satisfaction, though not necessarily in that order. Felicity: I got myself into trouble again and you killed him. You killed again and I'm sorry that I put you in a position where you had to make that kind of choice. Ollie: Felicity... he had you and he was going to hurt you. There was no choice to make. Laurel: If you want to attack me, go right ahead. But you should know you're not going to say anything that I haven't already said to myself. Ollie: Woah! I know that was difficult for you and I just wanted to make sure you were okay. Laurel: No! No! I don't understand how you can forgive me after what I just did in there! I don't understand how anyone could! We see Moira's press conference from 123 as The Count escapes from Iron Heights. We find out that he was transferred there after recovering from the effects of his Vertigo-induced madness as depicted in 119. During his escape, he hands the keys to the cells to The Dollmaker from 203. As in the case of The Dollmaker in 203, SCPD covered up The Count's escape. The STAR Labs particle accelerator is mentioned once again. Bethany Snow is once again the featured news anchor on Channel 52 news. Kate Spencer, last seen in 105, appears again as one of the lawyers in the Starling City District Attorney's office. It's revealed that Moira's allegations that Robert Queen cheated on her in 111 were true, as was Thea's guess that Moira had an affair with Malcolm Merlyn. Count Vertigo figures out that Ollie is The Arrow after going through Felicity's belongings. The news media is now calling The Starling City Vigilante by the name 'The Arrow"
Moira Queen is found innocent of all charges but it's revealed this was due to the influence of a not-yet-dead Malcolm Merlyn. Malcolm Merlyn is Thea's biological father. Shado is seen wearing a green hood whens he first confronts Ivo, just as Sara said in 205. The information on Miracle is revealed to be hidden in the arrowhead Ollie took from the Japanese grave. The information turns out to be a map coordinate - 30 31 75 12. Felicity - showing the intelligence one would expect of the heroine in a horror movie - goes into an unlocked ambulance in a dark alley by herself. You'd think in the absence of Diggle she'd call Detective Lance (who is curiously absent from this episode) to go along as back-up or - better yet - tip him off as to the location of a suspicious abandoned vehicle. Easily the worst episode of Season Two so far. The focus is shifted to the season's most minor subplot and we're reminded of how horrible all the court scenes from Season One were. Thea and Roy's romantic scene seems oddly out of place, even if you ignore Roy's suggestion that Thea should beat on him instead of a heavy bag or some other piece of appropriate equipment... which suggests things about Roy best left to fan fiction. Laurel continues to be annoying and Felicity is dumbed down to give Ollie someone to rescue. All this and the return of Count Vertigo - everyone's least-favorite villain from Season One. Even the title is bland and unimaginative. The only thing that saves it apart from the island sequences is the last ten minutes, in which we see just how far Oliver has grown as a character this season as he shows more concern for his friends than himself at a personally trying time and the revelation that Malcolm Merlyn is still alive.